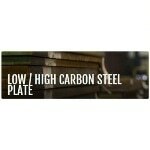 Leeco Steel is a proud approved vendor of Caterpillar Spec Steel Plate. All grades are proprietary to CAT. Leeco Steel manufactures the grades below in a range of imperial and metric sizes.